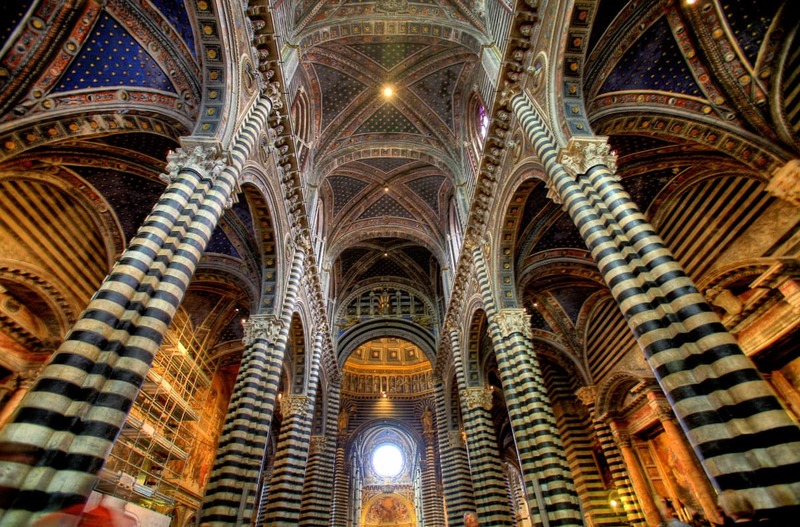 One of the most beautiful cathedrals in Italy is Siena Cathedral of Santa Maria. This grand building looks pompous from outside and contains numerous treasures of art inside. 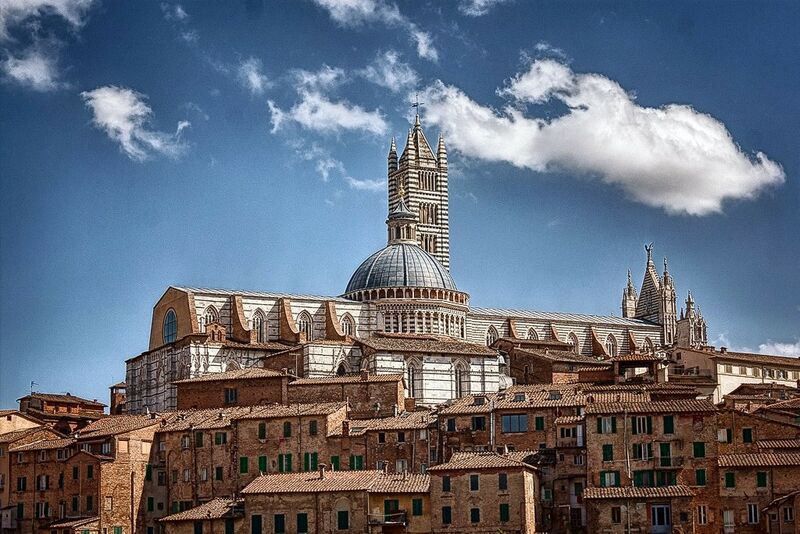 The historical hilltop city of Siena was established by Etruscans several centuries BC. 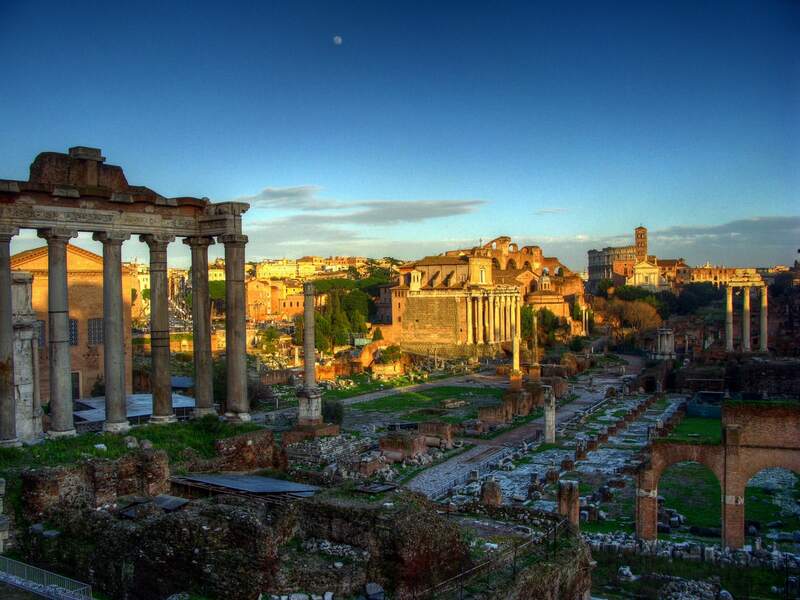 The present name of the city – Saena Julia – was mentioned in Roman writings in the 1st century AD. Located in a safe distance from the pirate infested sea, Siena became an important trade post on the way to Rome. It was one of the most important Italian city-states in the 11th – 16th century and its main competitor and enemy was Florence. The prosperous city and, possibly, the first banking centre in the world was one of the most important centres of arts in Italy in the 13th – 14th century. The great Siennese artists are less known today, but not less distinguished than the better known great Florentine artists. Siena has preserved nearly intact medieval and Renaissance architecture up to this day and is one of the most interesting medieval cities in Europe. Symbol of the grand ambitions of Siennese is cathedral of the city – planned as the largest cathedral in the world. Cathedral was built in the highest point of city, in the site of an earlier cathedral. It is not known when the first church was built here, but it is known that in the 9th century AD in this site was a church and bishop’s palace. In 1058 an important event took place here – pope Nicholas II was elected. 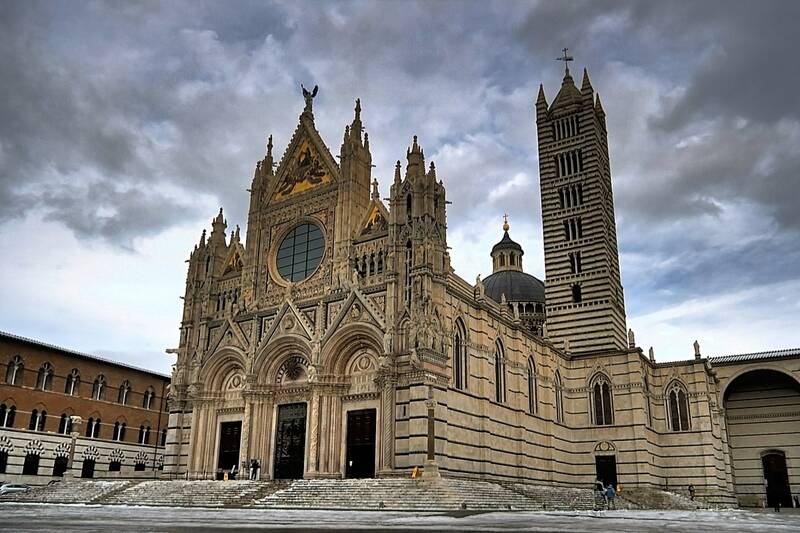 Preparations for the construction of a new cathedral of Siena were started in 1196. It was decided to start the construction with the north-south oriented transept and to add the main part afterwards. This north-south transept was basically built in 1229 – 1263 – and constitutes Siena Cathedral up to this day. Transport of construction material, including the black and white marble, started in 1226. Both the exterior and interior of the cathedral have outstanding ornamentation – alternating stripes of this white and nearly black – greenish marble. Facade is accented with red marble. It is considered that black and white colors symbolize the black and white horses of the legendary founders of the city – Senius and Aschius. Next to the cathedral in 1313 was built nearly 77 m tall belltower – stunning structure in Romanesque style. In 1339 were started further works – construction of the giant main body of the cathedral, which would increase the size of cathedral more than twice and make it larger than any other cathedral in the world. Since the very beginning these works were performed in a poor quality and were stopped by the Black Death in 1348. Floor of the unfinished cathedral was made – and is used as a parking lot and floor of museum. 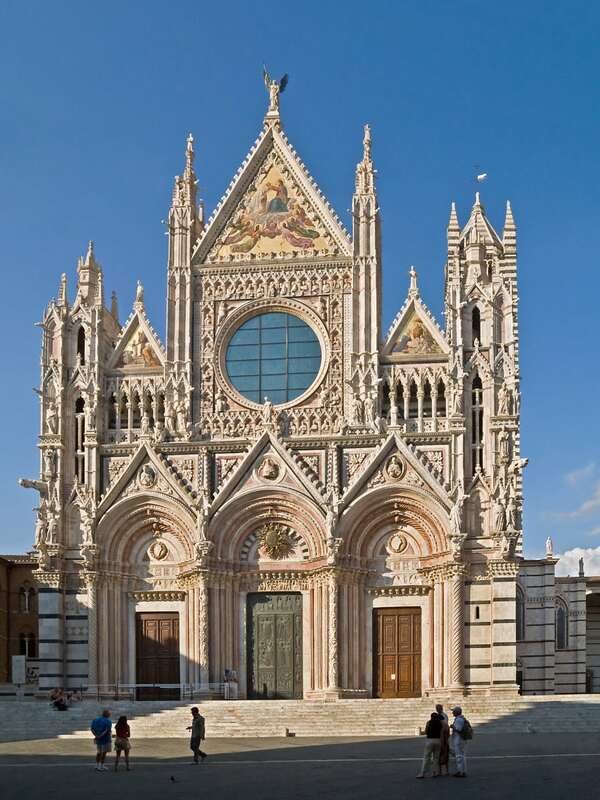 Siena Cathedral is built in Tuscany Romanesque style, with many details and ornamentation in Gothic style. This beautiful building in the plan has a form of a Latin cross, it has dome and tall bell tower. Dome is topped with a gilded lantern, which was made by Gian Lorenzo Bernini and resembles the Sun. Below the choir and below the current soil level is located entrance in the earlier church – the walls there contain frescoes from the late 13th century which depict scenes from the Old Testament. One of the oldest works of art in the cathedral is the beautiful pulpit, which was carved by Nicolà Pisano in 1265 – 1268. The list of art values in Siena Cathedral is very long – here are located works of Donatelli, Bernini, Michelangelo, Martini and numerous great Siennese artists. Siena Cathedral has some of the most stunning facades of any structures in the world. Most beautiful is the West facade – the main entrance in the cathedral with three portals. Works at this facade started sometimes around 1284 and were led by Giovanni Pisano until 1296. Works were continued by Camino de Crescentino. In 1317 works were stopped and more attention was paid to East facade. West facade most likely was completed in the 1360s – 1370s, for most part using the initial design of Pisano. Final works were overseen by Giovanni de Cecco, who made the facade even more ornate. Change of masters is seen in the design of the facade. 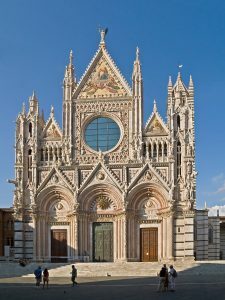 Thus – although in Gothic architecture it is common to have vertically continuous elements, facade of Siena Cathedral shows vertical discontinuities. Most of statues seen in the present day facade are copies of the original ones. The original statues are kept in Museo dell’Opera del Duomo. The fascinating mosaics on the three gables of cathedral were produced in Venice in 1878. The ornate bronze door replaced the wooden door in 1946. The black and white stripes inside the cathedral look even more impressive. Much effect is added by the stained glass windows. Especially valuable are the round stained glass windows in facades. 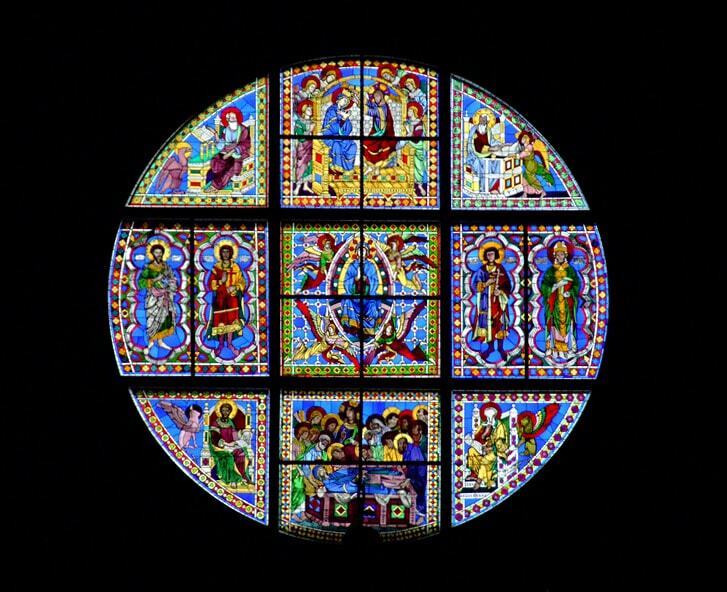 The stained glass window in the choir is from 1288 – one of the oldest stained glass windows in Italy. The large stained glass window in the facade is younger – from 1549. 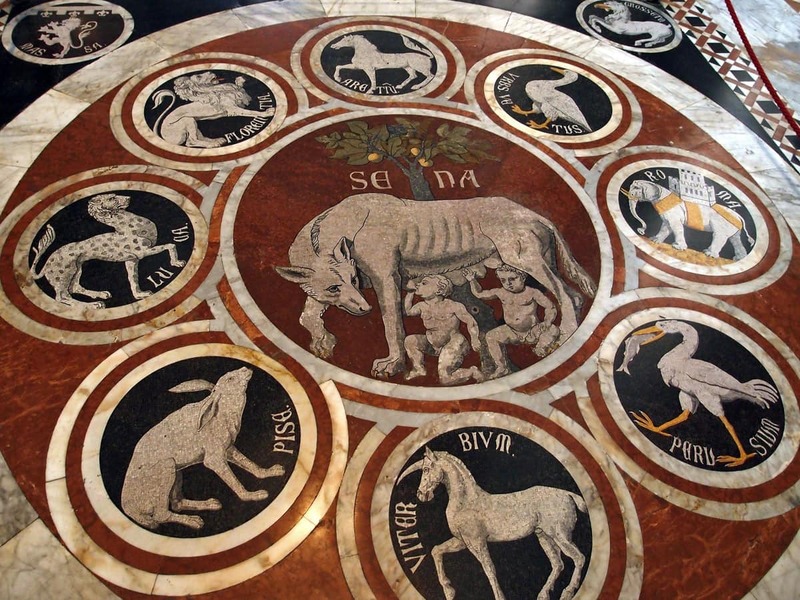 The marble mosaic floor is one of most beautiful pavements in Italy, made in the 14th – 16th centuries. This grand artwork takes the whole area of cathedral and consists of 56 diverse panels, depicting diverse themes, made in different techniques. For most part of the year the pavement is covered in order to preserve it. Adjoining the cathedral is Piccolomini library where is stored a rich collection of illuminated choir books. Library is ornamented with stunning, colourful frescoes by Pinturicchio. 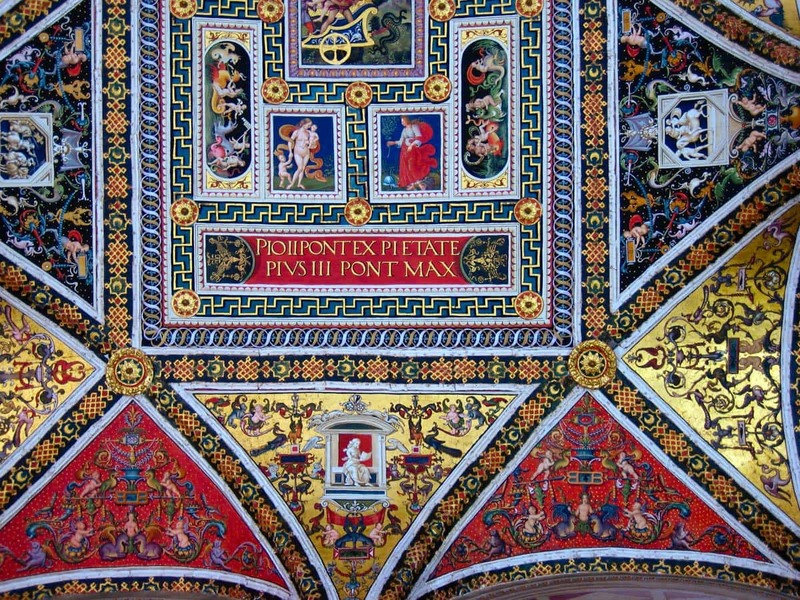 Piccolomini library was built in 1492, ornamented with paintings in 1502 – 1507 and devoted to Pope Pius II, who came from Siena. The beautiful baptistry of San Giovanni was built in Gothic style in 1316 – 1325. 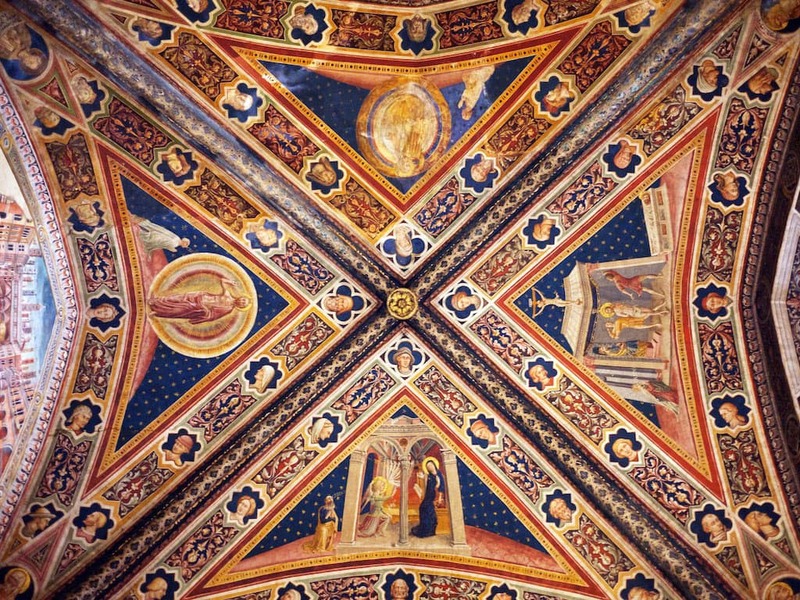 Its interior is stunning – it is adorned with frescoes which were made by Vecchietta and other painters in 1447 – 1450. Jane Tylus’s Siena is a compelling and intimate portrait of this most secretive of cities, often overlooked by travelers to Italy. Cultural history, intellectual memoir, travelogue, and guidebook, it takes the reader on a quest of discovery through the well- and not-so-well-traveled roads and alleys of a town both medieval and modern. It was May 2013 when Thomas Paradis convened in Siena, Italy, with a cohort of American faculty and students to lead a two-month inaugural study-abroad program. After a harrowing journey across the ocean, students and faculty alike soon realized that adapting to a foreign culture and language would be more challenging than they expected, especially amid one of the world’s more authentic community festivals-the Palio horse race.